As we struggle through the latest heat wave, I’ve been on high alert for frozen treats. Tonight, my eating buddy and I came across a Van Leeuwen Artisan Ice Cream truck on 2nd Avenue and 10th St. With the heat in the high 90s even at 8:30pm, we had the perfect excuse for some ice cream. I’m a huge fan of Earl Grey tea, so I ordered a small cup (pictured above). My friend, a fan of all things ginger, ordered a small cone of that. Mmm…. I had to take a picture of the truck because I knew I’d never remember the name otherwise. Here you go! The verdict? Worth a try. 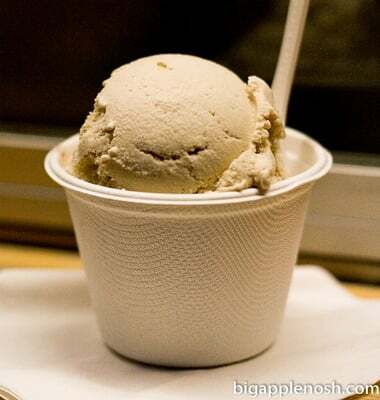 The Earl Grey ice cream was light and slightly citrusy, and it was creamy without being either too dense or aerated. The Ginger was sweet and not overly ginger-y – I’m not a fan of ginger, and I found it very enjoyable. My friend the ginger fanatic also liked it – so Van Leeuwen seems to achieved a perfect balance for that flavor. 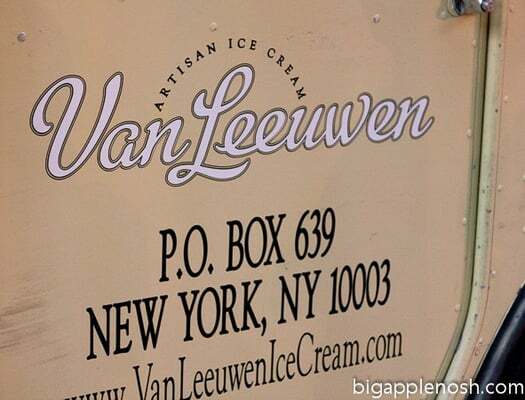 Van Leeuwen has locations throughout the city, but if you ever happen upon one of their trucks, I’d definitely recommend trying it out. The price is comparable to a scoop at Ben & Jerry’s, and with such a unique flavor selection, why not? A refreshing treat for a reasonable price, especially during this heat wave! We bought from the truck! i've seen these trucks around and sometimes they have one in my neighborhood–will definitely try it! and is that snot smeared all over the sign? or were you drooling too much? I saw one of these in Midtown the other day and almost caved…now I might have to next time! And OMG, we almost ran into each other! We were at 2nd ave and E 2nd for my movie screening tonight and we left around 8:30! It would have been so exciting to run into you, eee! Yum! That sounds sooo good. mmmmm. before i read that you chose the EG, i was thinking, That would be awesome. 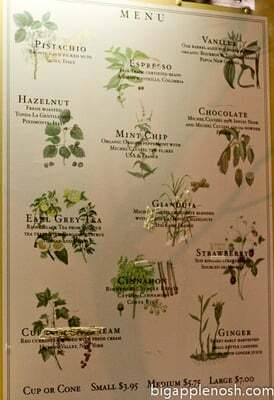 I love the botanical images they use with each flavor. Adds a little something lovely and special. it is so hot here, too. like my fingernails are sweating. this cooled me off a little. reading this about the ice cream. love your blog! I was lucky enough to try some of this when I was in NY last! I had strawberry… it was so good! I couldn't put my finger on what made it taste slightly different (in a good way) than "normal" ice cream… I thought maybe some sort of different animal's milk? Like goat? OK not really. I'm sure if it was goat's milk they would say it, right? Anyway, it was a great break from "the norm"! Ooh earl grey. Sounds good!